After the opening show-boat style number by Team Stage and Team Street choreographed by Reina Hidalgo & Asiel Hardison, “So You Think You Can Dance” host Cat Deeley announced which Team was leading this week from last week’s votes. With mentors Travis Wall (Team Stage) and Twitch (Team Street) on-stage, Deeley announced that Team Stage was currently in the lead with 52% of the votes from last week, to Team Street gaining 48% of the votes. The first dance routine of the night was with Alexia and Derek from Team Stage and Jaja from Team Street who learned a Contemporary number about bravery from Choreographer Stacey Tookey. They had to portray characters whom they can not relate to. Derek portrayed a Veteran, Jaja an abused woman, and Alexia a single mother. Judges Comments: Nigel thought that they listened to Tookey very well and did a great job. He said he would have never known that Jaja is a Krumper, and told her that she “blooms” into a better dancer every single week. Paula said Tookey “just gets it right”, and said all three of the dancers danced beautifully. Jason said the piece was timed perfectly and this country needed to see it. It was Derek’s best day he said and he was telling a story, and they all brought it to life. RESULTS: Alexia, Jaja, Derek – SAFE. Megz (Team Street), Moises & Jim (Team Stage) had to convince in a Hip-Hop routine. To Jim’s frustration, it was his second week in a row getting Hip-Hop style. Judges Comments: Paula said they were given a routine not technically challenging which requires them to fill-in the spaces with really committed to be in character and going over the top in the vibe and the feel. They really “have to show-up and take it to the next level.” Jason said this is where Megz really shows-up, and told the guys that they seemed more like the back-up dancers. Nigel said the Choreography was “just freedom”, more about the attitude and didn’t work. They danced a Jazz, Hip-Hopish piece where the two girls JJ, and Yorelis (both Team Street) are competing for Edson’s (Team Stage) attention Choreographed by Tovaris Wilson. Judges Comments: Jason advised Edson to keep his eye-contact moving and not just focused in on one girl or the other, and to play more flirtatious with the chararcter. Nigel said JJ and Yorelis are two of his favorite street dancers, and told Edson to show his sexuality more on stage. Paula reacted that they have to point the toes, and said Yorelis was more comfortable than JJ in that genre. They had to learn a Cha Cha dance choreographed by Jean-Marc Genereux who said it’s a fusion between stage and street where Asaf (Team Street) played a rock star and Marissa (Team Stage) portrayed a fan. Judges Comments: Nigel reacted to their routine with he doesn’t know what the “club Cha Cha” is but it didn’t feel like the Cha-Cha, but feel more like “protection Cha-Cha”. He noted that Asaf looks like a film star and doesn’t act like a film star. Nigel told Asaf he was happy to hear about how hard he’s working and reminded him that even the caterpillar eventually turns into a beautiful butterfly and his performance “was not good.” Paula told Asaf that “it didn’t work” but gets an “A” for effort. She complimented Marissa on her selflessness but wasn’t’ there for herself. Jason said it’s all about that connection and there wasn’t that connection with them and their relationship seemed fake. He advised Asaf to flex his muscles to gain some votes. The dance that Gaby (Team Stage) Ariana an Burim (Team Street) had to learn was African Jazz by choreographer Sean Cheesman. “The girls are besting it” and said this could be a break-through moment for Ariana. He also noted that the girls are over-shadowing Burim. Judges Comments: Paula complimented that it was a strong routine, then got teased when she said she liked Burim’s “package”, or video-tape. She said because it’s just as much about getting over the struggle as it is about succeeding. She called Ariana and Gaby “fierce” and refreshing. Jason told Burim don’t be afraid to look down and thought overall it was a good performance and one of the best performances of the night. Nigel was so proud of Gaby because she’s a tap dancer. He said he loved that Burim kept up with the girls and advised him to get it a “final punch” by positioning his body more down. Kate (Team Stage) and Neptune (Team Street) danced a contemporary piece choreographed by Justin Giles about a husband and wife saying goodbye before he goes off to his dangerous job. Judges Comments: Jason said the piece was “beautiful” and these kind of pieces are the hardest because there aren’t a million moves and requires the dancers to fill-in the spaces and have chemistry. He said “it’s working” because he believes it and graded them “A”. Jason said Neptune is becoming his favorite. Nigel said the routine was interesting and challenging because it was small, yet expansive. Nigel said when SYTYCD started, so many people complained about white and black couples dancing on the show. He said there was so much said in the routine and they portrayed it beautifully. Paula said such a simple and beautiful concept yet complex with emotion. She told Kate that she “was just right”, and Neptune is one of her favorites. 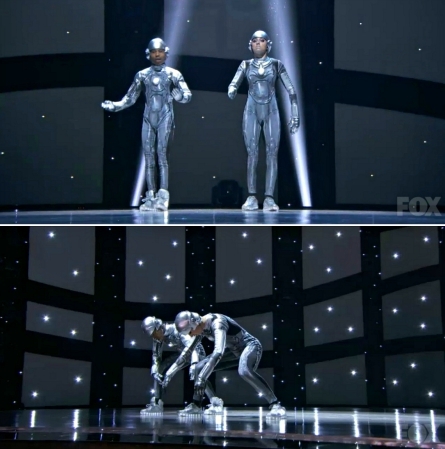 Hailee (Team Stage) and Virgil (Team Street) were turned into robots from outer space by choreographers Pharside & Phoenix who said the Hip-Hop routine is fast-paced. Mentor Twitch described Virgil’s energy as Arnold Schwarzenegger plus Richard Pryor wrapped into a nugget that is Virgil. They stayed in-character during the judges comments! Judges Comments: The judges were all on their feet at the end of their robot routine. Nigel said they are the best two characters that they have on the show this year, and it was really memorable an 20 years from now, this routine will be on the list. Paula said it was “fantastic, so much commitment and crazy fun!”. Jason said he knew Virgil was crazy but didn’t know Hailee was that crazy and it anxious to see how far she’ll go. The final Team Stage piece of the night was choreographed by Jaci Royal that was about team work and helping each other out. Winning the Twitter vote was Araina and Kate. This left Burim, Asaf, and Moises whose fates were in the hands of the Judges votes. Nigel noted that the judge know that both Burim and Asaf have not lived up to their true potential. On the stage side, they chose to keep Edson.